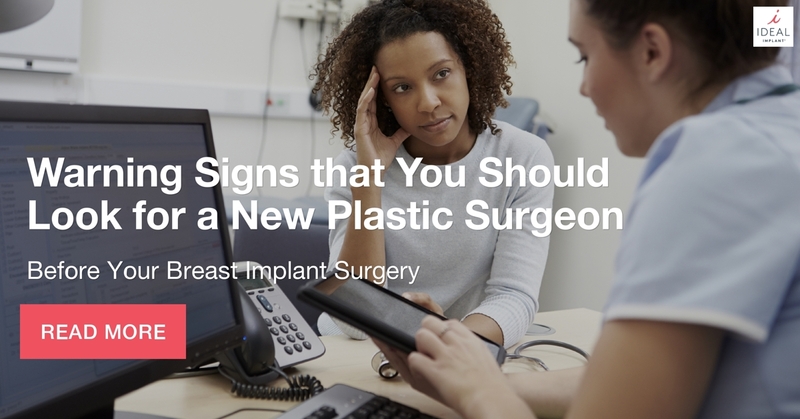 One of the most important steps you can take before your breast implant surgery is to pick the right plastic surgeon for you. But how do you do that? There are many factors that make a surgeon great, but most importantly, you need someone who will listen to you and put your concerns first. Read this guide before you start looking for a surgeon. Did you know some breast implants have a higher rupture rate than others? Or that if your silicone gel implant ruptures you may not realize it for months, or even years? Some surgeons don’t think this kind of information is helpful or necessary for their patients to know, especially if the patient doesn’t ask for it. But a recent independent survey of over 900 women found that 7 in 10 women state a lower rupture risk as a top priority when picking breast implants. Also, 98% of women stated they would feel somewhat to constantly concerned about a possible silent rupture in their silicone gel implant. Your surgeon should take these concerns seriously and not brush them aside when going over your breast augmentation options. Too often women’s concerns are not addressed by their surgeon and they end up with worries or regrets that they don’t feel comfortable bringing up. Breast implants will be part of your body for many years and you shouldn’t feel constantly worried about your implant rupturing just because you felt pushed into picking a certain implant type. Technology. Is your surgeon staying up-to-date on the current surgical techniques and technologies? Often new technologies will result in faster recovery, less scarring, and other favorable outcomes. Make sure your surgeon offers all of the breast augmentation options so you can weigh the benefits and compromises of saline implants, silicone gel implants, and the IDEAL IMPLANT® Structured Breast Implants. Good Patient Relationships. Ask friends or acquaintances how they feel about your surgeon. Do previous patients report feeling rushed or uncomfortable? Did the surgeon seem to push a certain brand that they may have ties with? Did the surgeon spend an adequate amount of time explaining each implant type, pros and cons, surgery, and recovery? Compassionate care is important when you are making long-term decisions about your body. Taking Long-Term Health Seriously. Your breast implants will affect you as much today as they will in 10 years. If you express concern about silent ruptures or getting an MRI every few years your surgeon should take those concerns seriously. Breast implants are categorized by the FDA as temporary devices, but they vary in terms of risks and maintenance over time. If you’re concerned about the long-term maintenance, capsular contracture risk, or rupture risk of an implant, then you are worried about long-term health needs and your surgeon should address that concern. When is it too late to find a new surgeon? As long as you are not laying on the surgical table under anesthesia, it is not too late. Pay attention to the following warning signs and start looking for a new surgeon if you notice too many. Your surgeon interrupts you. Have you ever had a conversation that felt completely one-sided? Even when you try to ask a question the other person starts talking before you can even finish your thought. That’s not how it should work when you are talking to your plastic surgeon about breast implant surgery. Taking the time to listen and answer your specific questions and concerns show your surgeon cares about you and your outcome. Your surgeon brushes off your questions. If you ask your surgeon a question, do they come back with “I wouldn’t worry about that”? An answer like this means your surgeon doesn’t feel like taking the time to explain things to you. Even if your concern is nothing to worry about your surgeon should recognize its legitimacy and take the time to address exactly why you shouldn’t be worried. Your surgeon pushes his or her favorite option. There are many breast augmentation options, and each surgeon may have one they prefer for certain reasons. While it is perfectly normal to explain why they like one the best, what they shouldn’t do is push you toward their favorite option when it might not be right for you. Your surgeon is skeptical of new technology. Don’t get us wrong; it can sometimes be good to be skeptical of the “latest and greatest” thing. But when it comes to new surgical technologies that have been reviewed and approved by the FDA, your surgeon should get on-board. When a surgeon decides against learning about or offering a new technology simply because it will change the status quo, their patients will suffer. New technologies, such as the IDEAL IMPLANT® Structured Breast Implant, can offer tremendous patient benefits and should not be overlooked. Your surgeon is not upfront and honest. If you find out your surgeon is neglecting to tell you about certain statistics, risks, or complications it is time to find a new surgeon. Holding back this type of information, for any reason, is unacceptable. Is the surgeon and his or her associates board-certified? Do you feel comfortable with the surgeon and staff? What kind of environment is the office? Comfortable or factory-like? What kind of facility will your surgery be in? It should be performed at an accredited operating facility, not the surgeon’s office. Can you see previous breast implant surgery before and after pictures? Does the surgeon have extensive skill and experience performing breast augmentations? Finding a surgeon who offers all the options for your breast augmentation will help you get the best outcome. The IDEAL IMPLANT® Structured Breast Implant is only offered through an exclusive network of board-certified surgeons. These surgeons are committed to staying up-to-date with breast implant surgery options, so their patients receive great looking results and keep their peace of mind. To find a surgeon near you who offers the IDEAL IMPLANT® Structured Breast Implant go to the IDEAL IMPLANT website’s surgeon finder.